Family Friendly: Yes. The tasting rooms allow children in them. Amenities: Restrooms at all of the wineries and in Jack London Square Marina, benches and picnic benches along the Bay Trail. A short distance from the Bay Area are the world famous wine-growing regions of the Napa and Sonoma Valleys. I love visiting wine country, but always wish it were just a bit closer. Well, now it is! Every day, grapes of from all over California are brought to the city of Oakland for blending, barreling, and bottling at a number of urban wineries. In 2010, Oakland wineries and tasting rooms banded together to form an urban wine route through the city. Visit Oakland, the city’s visitors bureau got involved in 2015 to infuse the route with a branding and marketing boost. Since then the route—now known as the Oakland Urban Wine Trail—has gained popularity and includes 10 wineries in a 10-mile radius. 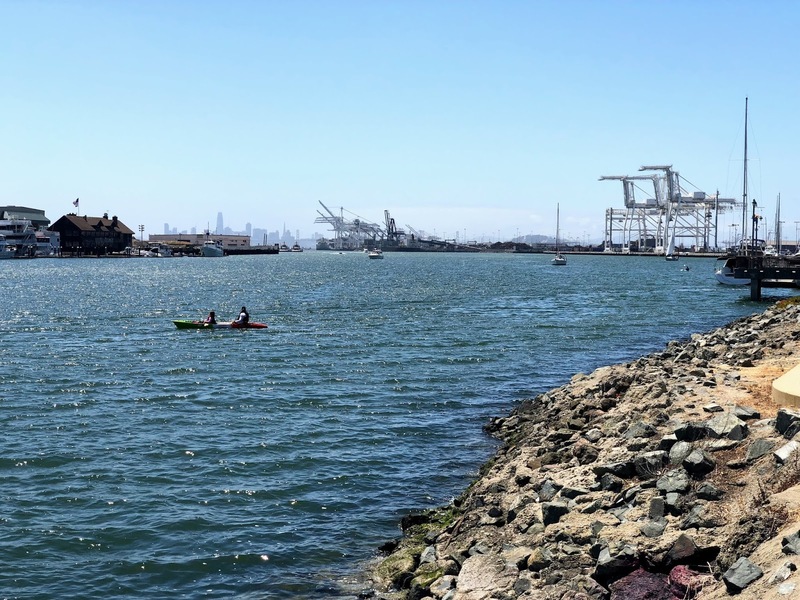 This hike, inspired by the Oakland Urban Wine Trail, visits four wineries in three miles as well as Jack London Square—an area named for the author who spent a lot his early life on the Oakland waterfront. 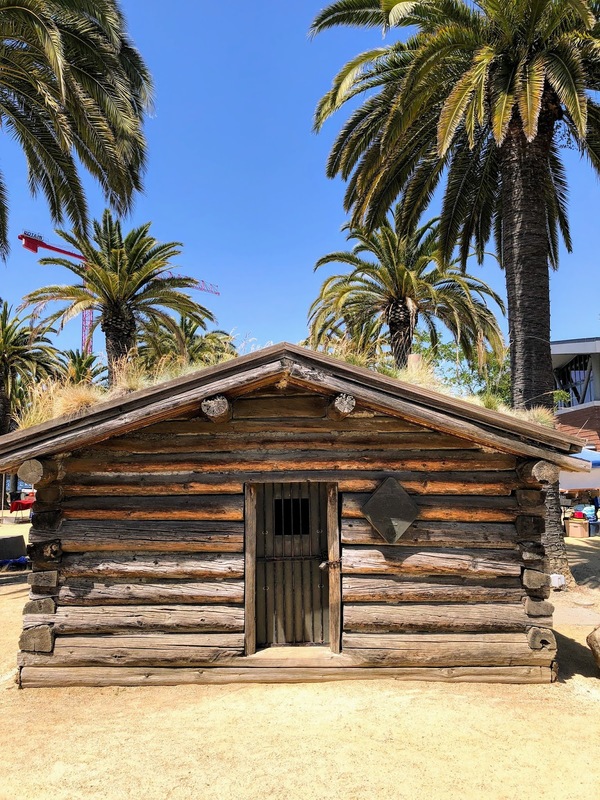 Today in the square, you’ll find shops, restaurants, ferry service to San Francisco, a Sunday farmers’ market, a former presidential yacht, an 1880s saloon, and even Jack London’s cabin—rebuilt and relocated from the Klondike region of Canada’s Yukon Territory. Wine lovers can sip tasty white and reds in industrial warehouses and on sunny outdoor patios. And drinkers and non-drinkers alike will enjoy a waterfront stroll infused with late-1800s history. This route is designed to be safe those who are imbibing. It’s short, spaces out the winery stops, and starts and ends at Lake Merritt BART so that no driving is required. Start the hike at Lake Merritt BART, on the northeast corner of 8th and Oak Streets. Head south on Oak until 4th Street, passing some charming Victorian homes before passing under the 880 highway overpass. Turn left onto 4th Street to arrive at the first winery on this route, Dashe Cellars (55 4th Street). Dashe is situated in a red building that takes up the second half the block. If you visit Dashe, head back to the intersection of 4th and Oak Street and turn left on Oak. At 3rd Street, cross to the far side of Oak and continue south (left). Pass 2nd Street and then cross over train tracks. Oak Street drops you on Embarcadero West where walk to the far side of the street and turn left. Stay on Embarcadero West 0.2 mile. Pass a building to your right with a striped roof, the Jack London Aquatic Center. Then take your next right onto a sidewalk, The San Francisco Bay Trail. Follow the Bay Trail along the water 0.1 mile, past the Aquatic Center and to a park, Estuary Park. Pass a picnic area with a geometric wood overhang, then continue along the waterfront path and follow it as it turns right, passing a few sculptures as you continue. Stay on the path and exit the park, following a Public Shore sign to pick up a more manicured part of the Bay Trail. Over the next 0.6 miles, you’ll have iews of the Oakland Inner Basin and Alameda Island across the water. 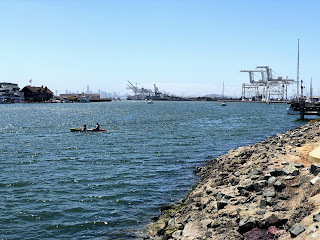 Toward the end of this stretch, you’ll see cranes that have become icons for the city of Oakland (no, they did not inspire the All Terrain Open Transport [AT-OT] walkers from Star Wars), views of the San Francisco skyline, and a marina. You arrive at the Jack London Square marina, a building with a faux lighthouse tower. Just past this building, you can walk left and out onto the pier for a nice view of San Francisco. Whether you explore the pier or not, you’ll next want to head into pedestrian plaza full of palm trees. 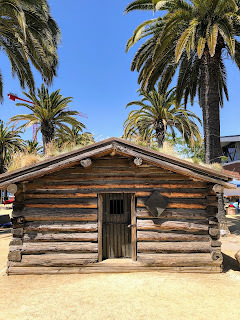 In the middle of the plaza, among other things, you’ll see Heinhold’s First and Last Chance Saloon and Jack London’s Cabin. Built out of an old whaling ship in 1880, Heinhold’s First and Last Chance Saloon was first a home for men working oyster beds on the San Francisco Bay. John Heinhold purchased the building in 1883 for $100 in and turned it into a saloon. When it first opened, waterfront workers frequented the watering hole as well as local literary luminaries Jack London, Robert Louis Stevenson, and Joaquin Miller. The saloon has been in continuous operation since its opening and became an Oakland landmark in 1975. Jack London is often called a native son of Oakland, but he was born across the bay in San Francisco in January 1876. His mother was Flora Wellman, and while it’s not confirmed, many believe his biological father was astrologer William Chaney. Flora Wellman married John London late in 1876, giving Jack London his last name. London went to grade school and high school in Oakland, then attended UC Berkeley. He headed up to Canada’s Yukon Territory in 1897 looking for gold. While he didn’t strike it rich, his adventures became fodder for his writing. London’s log cabin was abandoned after he returned to California. It was later dismantled and reassembled as two cabins—one in Dawson City, Yukon Territory and the other right here in Oakland. By age 30, London was internationally famous for Call of the Wild (1903), The Sea Wolf, (1904) and White Fang (1876). Before he died at age 40, he had written more than 50 fiction and nonfiction books and hundreds of short stories. Continue by the plaza and turn left at the large Water Street sign to stay along the water and get more San Francisco views. When you reach a viewing area with an old mast, turn right. Continue on the Bay Trail and look for a statue of Jack London. Stay on the Bay Trail 0.2 more miles until the San Francisco Bay Ferry is on your left and Rosenblum Cellars is your right. This is Clay Street. Between the ferry and Rosenblum Cellars, look left out to the water where you’ll see the the USS Potomac, Franklin Delano Roosevelt's presidential yacht from 1936 until his death in 1945. If you like, take a break at Rosenblum Cellars or keep going on Clay Street past Embarcadero West where you cross train tracks. Continue one more block to 2nd Street where you turn right. You’ll be on 2nd Street for a total of 0.5 miles. After two blocks, reach Broadway (no sign) where you look right to see a Jack London Square sign. As you continue along 2nd Street, you’ll pass an area with produce markets. Then four blocks later, at the intersection with Alice Street, pass by the Oakland Amtrak Station. Arrive at Urban Legend Cellars on the corner of 2nd Street at Jackson Street. Take a left on Jackson Street and once you get to 3rd Street, you can pop into Brooklyn West Winery at 201 3rd Street. From here continue one block east to Oak Street where you turn left. Stay on Oak until you arrive back at Lake Merritt BART. 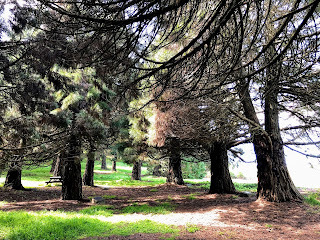 Have a picnic at Lake Merritt or walk around the lake. Dog Friendly: Dogs are allowed under voice control on park trails. There is a dog fee of $2 per dog. (No fee for guide/service dogs.) Fees are collected on weekends and major holidays. Amenities: Numerous restrooms and picnic areas throughout the park. There is just something so calming about hiking through redwoods. Perhaps it’s because as the tallest trees in the world, they make us realize just how small we are. Perhaps it’s because their thick canopy seems to block out the noise and chaos of the the outside world. Whatever it is, whenever I see them, I feel very lucky to live in the Bay Area—one of the few places on earth where these trees grow and thrive. Redwood Regional Park is a treasure and gives you access to a redwood forest that’s close to the city, but free of the Muir Woods crowds. These redwoods aren’t nearly as large as some of those in Muir Woods, but they are still tall, majestic, and plentiful. Redwoods are native to this part of the East Bay, however, all of the area’s old-growth trees were chopped down between 1845-1860 as people flooded into the Bay Area during the Gold Rush. After that time, trees began to grow back and it was thought that many of them grew to be over 100 feet tall. But these second-growth trees were logged again—this time to rebuild San Francisco after the 1906 earthquake. While some second-growth trees remain, many of the redwoods you see in the park today are third-growth trees. They are far from ancient, but they’re still over 100 years old, tall, and growing more with every passing year. There are seemingly limitless possibilities for hiking in Redwood Regional Park. 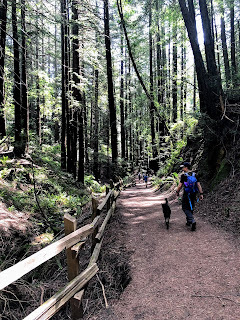 I like this particular route, which includes the West Ridge Trail, the French Trail, the Stream Trail, the Prince Trail, and the East Ridge Trail as it has a nice variety of scenery (exposed sunny trails, redwoods, creeks, etc. )—and because it comes with a special bonus in winter—thousands (hundreds of thousands? millions?) of ladybugs converge here in the months of November through March. The beetles fly into the park seeking a place to mate and to feast on aphids, using pheromones left by previous generations to return to the same spots year after year. Center stage for this annual phenomenon is the junction of the Stream and Prince Trails. But there’s no need to wait until winter to do this hike. Whenever you do this route, it’s an excellent escape from urban life just miles away from the city. Start the hike in the Skyline Staging Area and head right. When the trail splits almost immediately, head right to pick up the West Ridge Trail, a wide fire road above a canyon. Be aware that trail is bike friendly, so you may be sharing the trail with cyclists. You will also want to be on the lookout for poison oak. After one-half mile, see a first stand of redwoods on your left. 375 feet later, turn left on the French trail, a single-track trail heading downhill. The trail is shaded and lined with bay laurel trees, ferns, and abundant amounts of poison oak. Watch your step as you descend—the trail is dotted with rocks and roots and there are sometimes downed trees here. 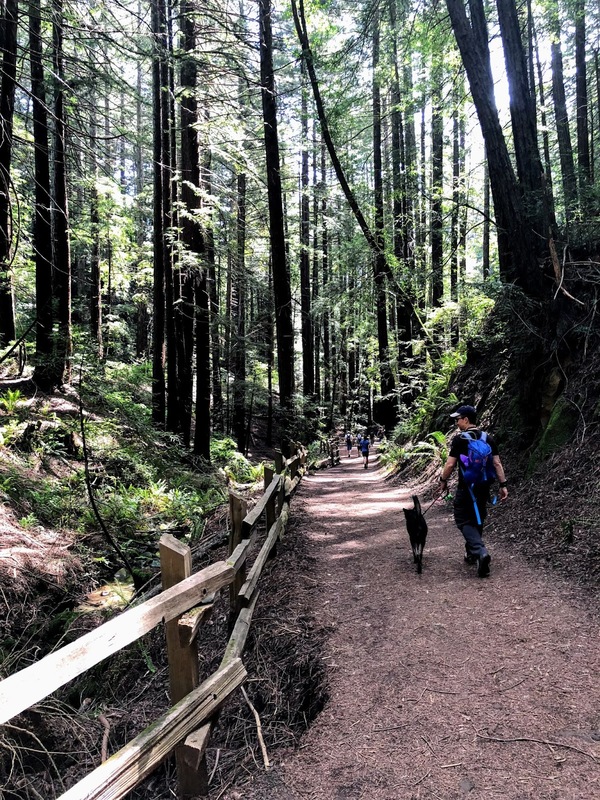 After 0.6 mile on this trail, turn left onto the Tres Sendas trail (a “senda” is path or route in Spanish), a wide trail full of redwoods and running along Redwood Creek. Continue 0.25 mile on the Tres Sendas trail, walking through a fallen tree and bearing left to stay on this trail at its intersection with the Star Flower Trail. After another 425 feet, cross Redwood Creek and turn right onto the Stream trail. This is a wide, relatively flat trail, and due to the creek’s sensitive habitat, dogs must be on leash here. After 0.45 miles on the Stream Trail, reach the Prince Trail. If you’re visiting during ladybug season, feel free to take a little detour to continue farther on the Stream Trail to catch more glimpses of the colorful beetles. Otherwise, head left and uphill on the Prince Trail. You’ll be on this trail for 0.4 mile, half of which is shaded and half of which brings you up and out of the trees. Take your time on this steep trail as this is where you’ll gain back 300 of the 550 feet you lost on the first half of the hike. Turn left on the East Ridge Trail, a wide fire trail with no tree cover. After 250 feet, look for a bench with views of the tops of redwoods. Stay straight on the East Ridge Trail when you pass a turnoff for the Philips Loop after 0.2 mile. After you pass this intersection, start looking behind you for views of Mt. Diablo. From here, there are two ways you can finish the hike. The most straightforward way is to continue on the East Ridge Trail another mile to the parking lot where you started. Like the West Ridge Trail, this trail is bike friendly, so be aware that there may be cyclists here. Another option if the East Ridge trail is crowded or you feel like changing things up is to turn left on the Eucalyptus Trail 0.3 mile after the Philips Loop turnoff. If you do this, you’ll head downhill on the Eucalyptus Trail 0.1 mile and then turn right on the Philips Loop. Follow the Philips Loop 0.65 mile, enjoying this partially shaded trail lined with eucalyptus and some madrone trees. 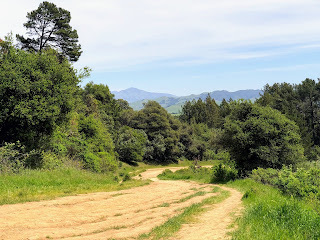 This trail can get muddy after a winter or spring rain and can be lined with poison oak. If it’s recently rained when you’re visiting, the East Ridge Trail may be your best bet. Then turn left on the East Ridge Trail and continue 0.2 mile on the East Ridge Trail back to the parking lot where you started. 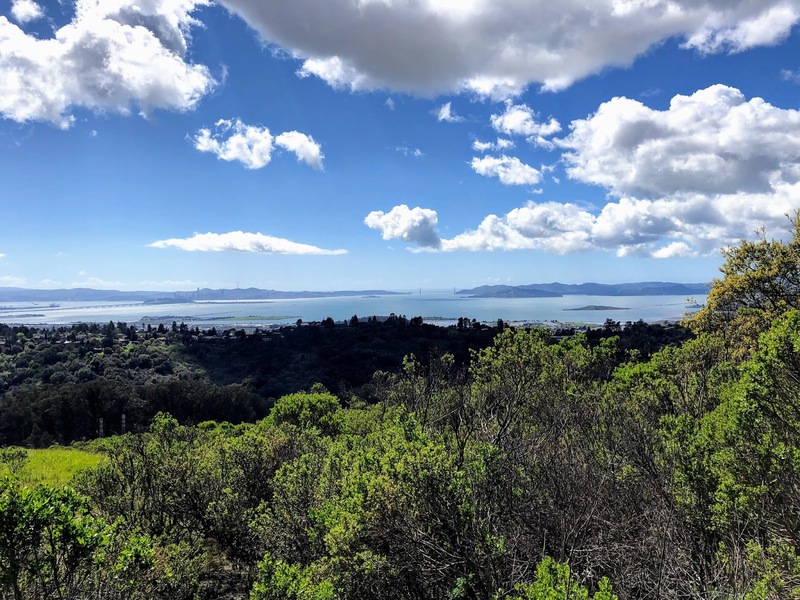 If you’re up for more hiking, Huckleberry Botanic Regional Preserve and Sibley Volcanic Regional Preserve are close by. Or, if you’re done with hiking, feel free to check out the Chabot Space and Science Center, an observatory with exhibits, telescopes, a planetarium, and more. Family Friendly: Yes, families who can’t hike too far can still visit the environmental education center and Tilden Little Farm. Getting there: Take AC Transit Route 67 to the Canon Drive and Environmental Center stop, which leaves you just a few feet from the hike start. Parking: There is a parking lot with free parking at the end of Central Park Drive, but it can be very busy on weekends. The Tilden Little Farm isn’t billed as a zoo, but the crowds at this park on weekends will make you feel like you’re in one. Take a deep breath—once you pass the farm, the crowds thin out dramatically, and you can enjoy nature and quiet trails. 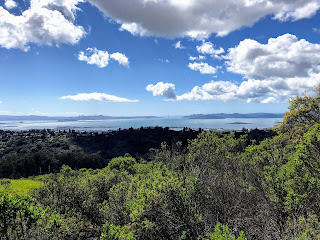 This hike heads to the top of Wildcat Peak, one of the most scenic viewpoints in the East Bay. In addition to the panoramic views you’ll take in from the top, the route involves narrow shaded trails, creek crossings, a lake, and the Berkeley Rotary Peace Grove, a grove of sequoias with individual trees dedicated by Rotary International to people and organizations who have worked for peace. Note that the trails can be very muddy after a rain. Bring good shoes you can get dirty if you’re hiking during the rainy season. From the parking lot on Central Park Drive, follow the road until it ends in a loop and where you’ll see the Tilden Nature Area sign. Enter the park using a path on your right marked with two short wood posts. Then head uphill and straight in the direction of the Little Farm. Pass the cow barn on your right and stay straight on the paved trail. When you reach a building labeled the Nature Lodge at 0.13 mile, turn left on a dirt path in front of the lodge. Pass the lodge and look for the Laurel Canyon Trail on your right. Continue about 50 feet on the trail, turn left on the Loop Road, and take a quick right to stay on the Laurel Canyon Trail. You are now in a fragrant eucalyptus forest that feels far from the crowds at the park entrance. As you continue on this trail, there are ferns and poison oak lining the trail. After 0.24 mile, reach a junction with the Pine Tree Trail. Continue straight and downhill on the Laurel Canyon Trail another 0.11 mile. The trail continues downhill, narrows, and for a short time, and is surrounded by blackberry plants. On this stretch, you’ll also may cross some small, seasonal tributaries of Laurel Creek. When you reach a trail marker for the Laurel Canyon Trail, Laurel Canyon Road, Nimitz Way, and the Peak Trail, head straight and downhill. On this 0.16-mile stretch, you’ll cross Laurel Creek and climb a flight of stairs. You then take a few steep narrow switchbacks uphill. You’ll feel like you’re climbing out of a canyon as the first rays of sunlight hit your face. When you reach a wide fire trail, Laurel Canyon Road, head right and uphill. After 0.15 mile, turn left to pick up the Peak Trail, a narrow singletrack trail. Climb to the top of the trees. Ater 100 feet, reach a T where you turn left to stay on the Peak Trail. After 0.05 mile, reach the Rotary Peace Grove on your right. There is also a bench, which is a nice place to have a picnic (but I suggest waiting to wait for a break at Wildcat Peak). If you’re interested, read the plaque at the opening of the grove and to enter to visit the dedications. In 1955, 100 great sequoia trees were planted in this area, a former NIKE missile base. Now, each year Rotarians name a person or organization from anywhere in the world who has worked for peace. A plaque is then placed in front of one of the trees. Past honorees include Nelson Mandela, Dr. Martin Luther King, Jr., and Malala Yousafzai. When you’re done visiting the grove, continue on the Peak Trail for another 0.2 mile. Now you have views of San Francisco; the Bay Bridge; the Golden Gate Bridge; and Angel, Alcatraz, and Treasure Islands. You can also look behind you to get views of Mt. Diablo. When you reach the next marker for the Peak Trail, even if you’re sick of climbing, it is a must to head right to the top of Wildcat Peak and the Peace Grove Look-Out where you get 360 degree views of the entire area from 1,180 feet in the air. In addition to the sights mentioned just before, you can also see San Pablo Reservoir from here. This is one of the best panoramic viewpoints I’ve seen in the entire Bay Area. When you’re done visiting the overlook, head back to the last Peak Trail marker you passed. This time, turn right and head down the hill. You’ll be on this trail for a total of 0.97 mile (downhill all the way)! For the first part of this stretch, you’ll continue to have views. You’ll then head back into the woods, eventually visiting a nice eucalyptus grove. When you reach a marker for the Sylvan Trail, turn right. Follow the Sylvan Trail for .27 mile to reach a T with a fence and marker for the Jewel Lake Trail. Turn right (though both left and right will take you to Jewel Lake) and continue 0.05 mile to reach marker #9 where you head left toward the Visitor Center. You are now on a wide fire trail that leads to a rest area and bench on your left after 0.03 mile. Across from the rest area, turn right on the Pack Rat Trail, crossing over a bridge and dam. Jewel Lake and redwoods are on your left. After you pass the lake, follow the trail as it bends left. You will soon get a view of the lake from the other side. After 0.1 mile, follow the Pack Rat trail left toward the Visitor Center. This part of the trail is lined with blackberry bushes, ferns, and laurel. For the last 0.35 mile of the trail, walk along Wildcat Creek until you reach the parking lot and the end of the hike. Have a picnic by Jewel Lake or visit the Tilden Little Farm or the environmental education center. If you feel like hiking more, visit Tilden Regional Park. When I moved to San Francisco in 2007, my dad got me a copy of that year's San Zagat restaurant guide and a copy of Stairway Walks in San Francisco. These books became part of a growing collection of books that helped me explore my then new home. With the holiday season coming up, gifts are on many of our minds. Here I've chosen five of my favorite books about San Francisco, any of which would make a great gift for people who live in and love San Francisco. Full disclosure, my own book is in here, but I think it does make a fun gift!At the bottom of this list, I suggest some other books that I have not read yet, but that may also be great for lovers of San Francisco. Stairway Walks in San Francisco is a classic for urban explorers. The ninth edition of this book includes 34 walks in neighborhoods as diverse as the city itself: Forest Knolls, Dogpatch, Nob Hill, Russian Hill, and more. What the walks all have in common is that they highlight the stairways in each neighborhood they visit. The book comes with turn-by-turn directions, quick turn-by-turn directions, and black-and-white photos and maps. Inspired by Stairway Walks in San Francisco, Urban Trails San Francisco helps you explore the city's stairways, hills, and hiking trails. The book includes stairway walks, but also trails through eucalyptus forests, sand dunes, and rocky cliffs above the Pacific Ocean. The book features 40 hikes in San Francisco, six in Marin County, and four south of the city. A companion book for the East Bay will be released in 2020. 111 Places in San Francisco That You Must Not Miss delights even old-time San Franciscans with novelty. 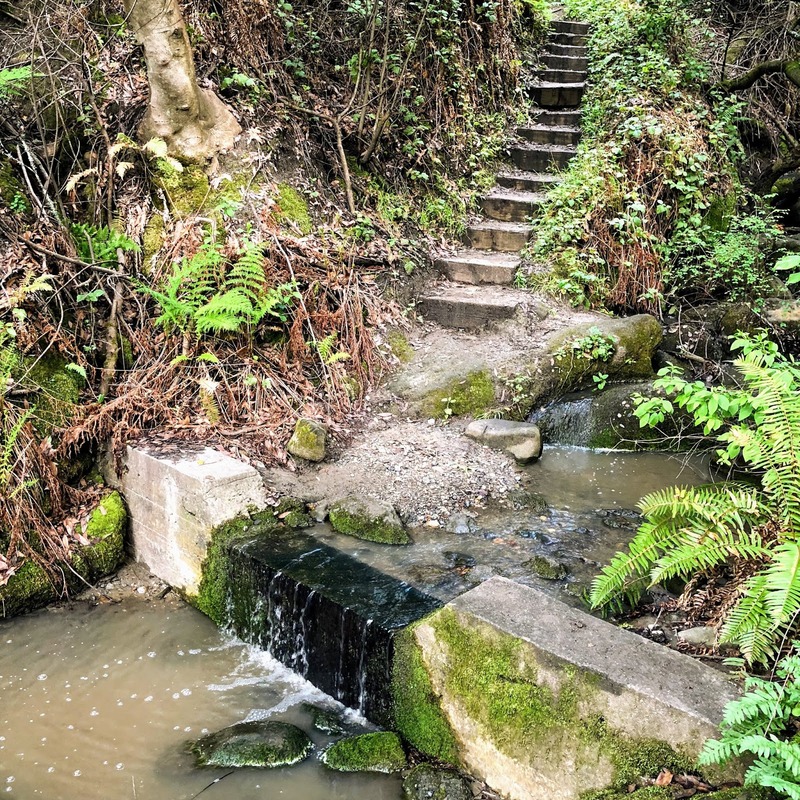 From restaurants like Foreign Cinema to oddities like the Ingleside Terrace Sundial to experiences like the Glide Memorial Church to local institutions like Heath Ceramics, the book helps you explore new places or see a new side of old favorites. This book serves as a great inspiration for a San Francisco bucket list you can check off one item at a time. Named for the George Sterling poem by the same name, Cool Gray City of Love is a beautifully-written poem to the city. 49 neighborhood-focused vignettes explore different views of the city. Author Gary Kamiya was a co-founder and longtime executive editor of the website Salon.com, and the former executive editor of San Francisco Magazine. He now writes a bi-monthly column called "Portals of the Past" in the San Francisco Chronicle. This book is great as you can devour it all at once or one short story at a time. Tales of the City, the only fiction book on this list is a must read for residents and lovers of San Francisco. The first book in Armistead Maupin's 9-book series transports readers to the wild, gender-bending, drug-infused San Francisco of the 1970s. Our unlikely heroine Mary Ann Singleton takes a vacation to San Francisco and decides to move here from the midwest...and the adventure goes from there. This book is addictive and so hard to put down. It features many places you can visit today like Macondray Lane and Washington Square Park. As mentioned above, I haven't read these, but I mean to! They seem like great additions to any San Francisco book collection. I just bought this book, but haven't fully explored it yet. The Amazon description says, "Wildsam Field Guides: San Francisco leads travelers into the most authentic experience of the California city, working closely with a team of trusted locals." Season of the Witch has been on my Kindle for over a year, but I just haven't gotten to it yet. The Amazon description says, "Salon founder David Talbot chronicles the cultural history of San Francisco and from the late 1960s to the early 1980s when figures such as Harvey Milk, Janis Joplin, Jim Jones, and Bill Walsh helped usher from backwater city to thriving metropolis." Infinite City: A San Francisco Atlas looks like a book I could pour over for hours. The Amazon description says: "What makes a place? Rebecca Solnit’s brilliant reinvention of the traditional atlas, searches out the answer by examining the many layers of meaning in one place, the San Francisco Bay Area. Aided by artists, writers, cartographers, and twenty-two gorgeous color maps, each of which illuminates the city and its surroundings as experienced by different inhabitants, Solnit takes us on a tour that will forever change the way we think about place." Maybe I'll put this last one on my holiday wish list this year. ;) Happy holidays and happy reading. 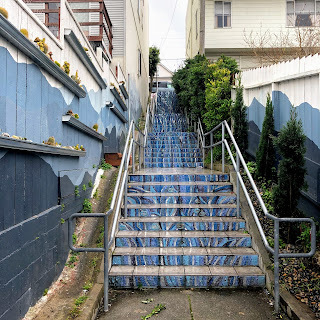 San Francisco is home to six beautiful mosaic stairways (see map here), but they were all inspired by one. 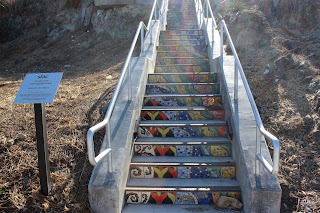 The 16th Avenue Tiled Steps project began in early 2003 when Sunset residents Jessie Audette and Alice Xavier conceived of the idea to bring people together and beautify the neighborhood. Later that year, project volunteers chose Aileen Barr and Colette Crutcher as the project artists. The 163-step mosaic depicts a landscape that goes from the bottom of the ocean, to land, and all the way to the sun in the sky. More than 300 neighbors participated in the creation of the mosaic panels. 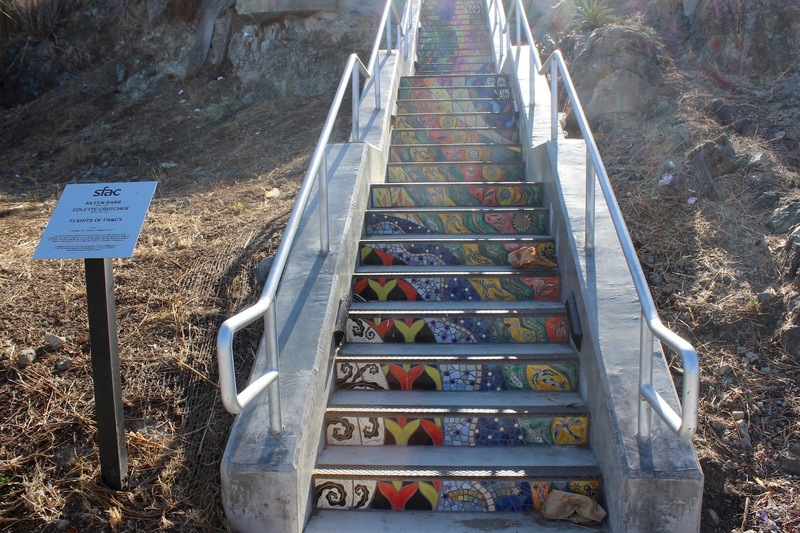 Work started on July 13, 2005, and the ribbon-cutting ceremony was held on August 27, 2005, which the mayor’s office proclaimed “16th Avenue Tiled Steps Day.” The inspiration for the steps came from Selarón’s staircase, a mosaic staircase in Rio de Janeiro named after artist Jorge Selarón. Jesse Audette discovered the staircase while living in that city. 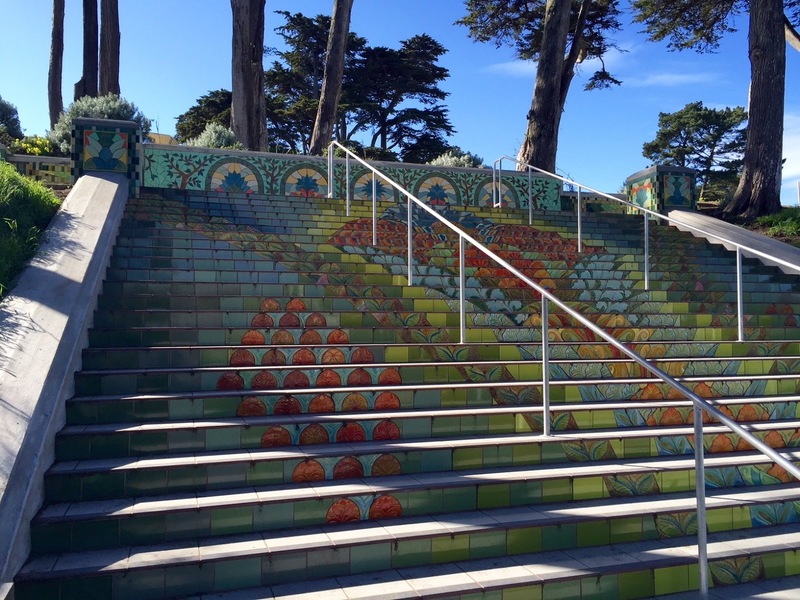 Inspired by the 16th Avenue Tiled Steps, the neighboring Hidden Garden Steps were conceived in January 2010 and completed in November 2013. Aileen Barr and Colette Crutcher were called in again to create this 148-step mosaic depicting flora and fauna, including flowers, ferns, butterflies, and a salamander that extends up 26 stairs. 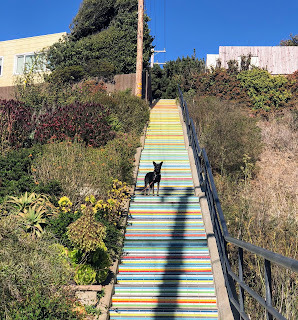 One year later, Barr and Crutcher won a competition to design the 87-step Flights of Fancy stairway in the Bayview neighborhood. This mosaic pattern was inspired by decorative patterns from Ghanaian Adinkra cloth, Central American weaving, Middle Eastern tile and Native American pottery. This stairway is on Aurelious Walker Drive, a street named for a pastor and champion of the Bayview neighborhood. 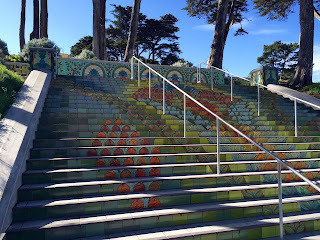 San Francisco’s most recent mosaic stairway is the Lincoln Park Steps, situated next to the Lincoln Park Golf Course. 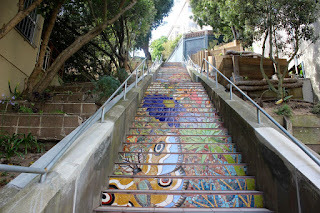 In 2007, a neighborhood organization, the Friends of Lincoln Park, began a seven-year long renovation of the 52-step-stairway. Barr and Crutcher came back for their fourth mosaic, which was inspired by historic photographs of Sutro Baths and buildings of the 1890 World’s Fair in San Francisco. The renovated steps debuted their new design on May, 28, 2015. Kenny Alley was a forgotten stairway across the street from the Excelsior Safeway grocery store. 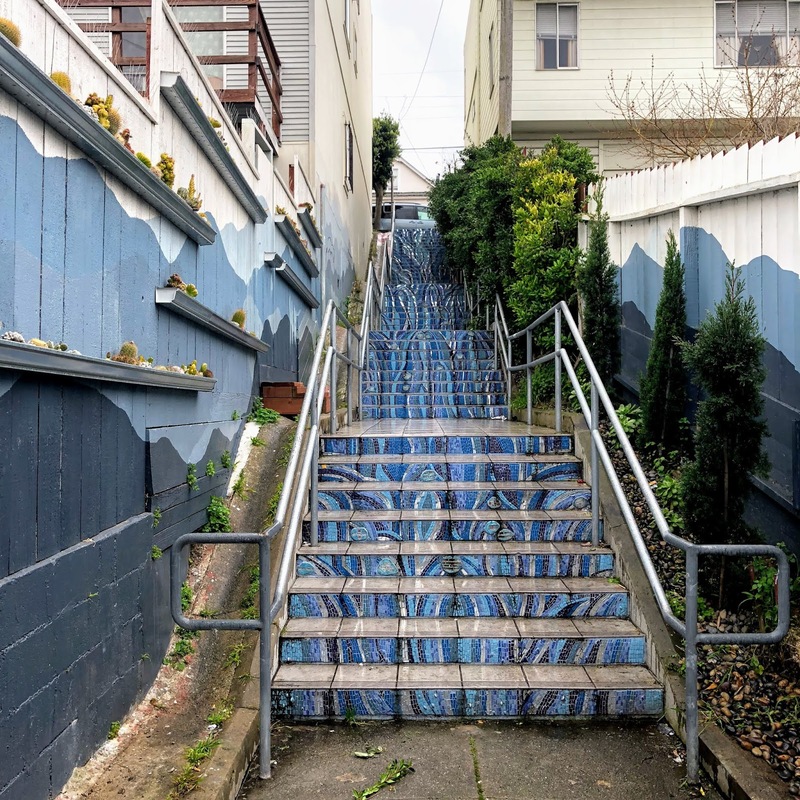 The Kenny Alley Steps project was started in 2016 to beautify the area and increase foot traffic to the grocery store, local businesses, and public transit. The design is represents flowing water and hearkens back to the time when the Excelsior was part of a watershed. Kim Jensen, a local artist and teacher at the City Arts & Tech High School, led the design work. And another local artist, Matt Christenson, created a complimentary mural alongside the steps. Opened in mid-2017, the Athens-Avalon Greenspace has transformed a former undeveloped plot of land and former dumping ground into a beautiful green space and neighborhood attraction for the Excelsior. This stairway was a long time coming. The original idea for improving the stairway came about in 2008 and the design was finalized in 2010. 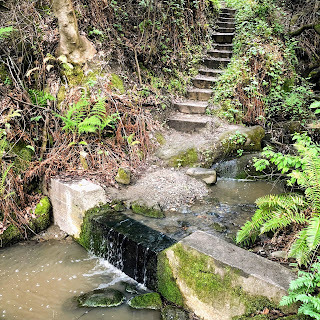 The stairway is lined with gardens full of drought-resistant plants and is just a few blocks away from San Francisco's second largest park: John McLaren Park. Which stairway is your favorite? 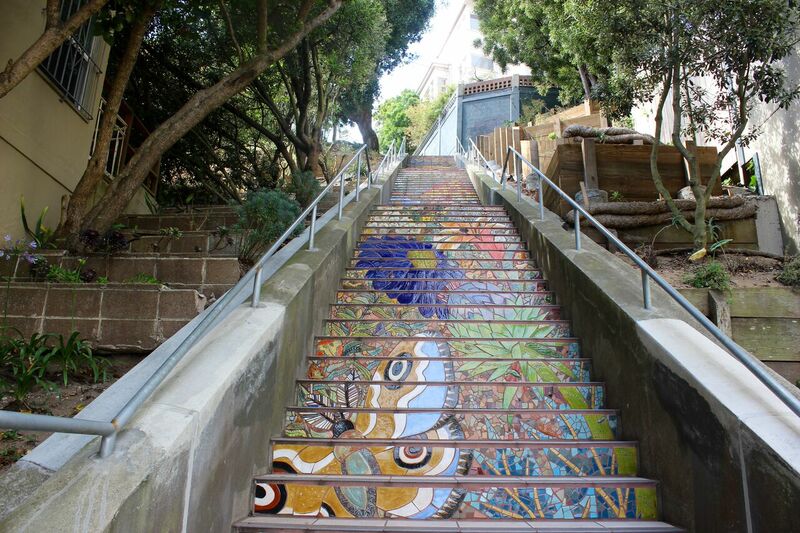 Where would you like to see the next mosaic stairway? I love exploring the hills, parks, and stairways of San Francisco and sharing my findings with friends. Find me at www.urbanhikersf.com.